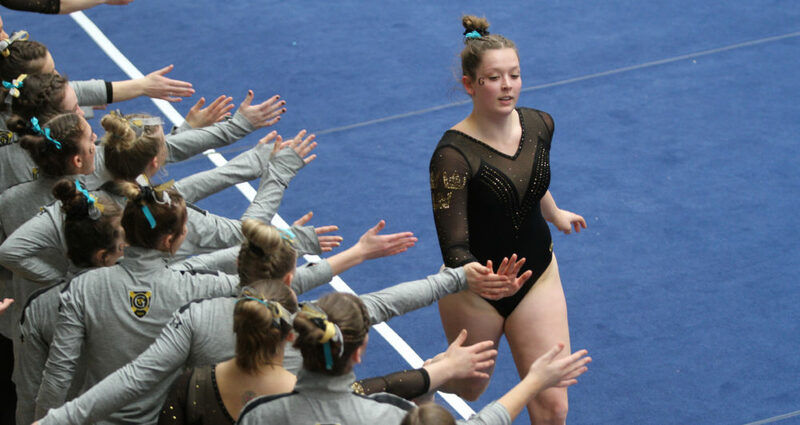 MINNEAPOLIS, Minn. – The Gustavus gymnastics team Saturday started its 2019 season, taking fourth at the Best of Minnesota Meet at the University of Minnesota. The Gusties scored 182.175, which is the highest team score in the first meet of the season in program history. The Gophers won the meet with a score of 195.600. Hamline took second at 183.500 and Winona State placed third at 182.325. Gustavus’s strength was on the vault, scoring 46.900, which was the highest among the three Division III institutions. Sophia Redding (Fy., St. Paul, Minn.) and Samantha Ardy (Sr., Thousand Oaks, Calif.) scored 9.525 and 9.450, respectively, which placed sixth and eighth, and were the top Division III marks. Amanda Malo (Sr., Greenwood, Minn.) led the Gusties on the bars with a 9.225, taking ninth place (3rd/Div. III). Malo and Jamie Erdely (Sr., Phoenix, Ariz.) each totaled 9.325 on the floor to place 10th (4th/Div. III). Samantha Tonjes (So., Eden Prairie, Minn.) was awarded a 9.325 on the beam to take 13th (7th/Div. III). Gustavus travels to UW-Oshkosh next Saturday. Way to go Gusties! Congratulations!